You don’t need a gym to get in shape or stay that way, and there are a couple of advantages to going gym-free. You can save time and money, and even reduce stress. Workout equipment: to buy, or not to buy? You save the cost of your membership and any special training or classes you pay for. You can also stop buying fancy workout clothes or buying food or drink at the gym. 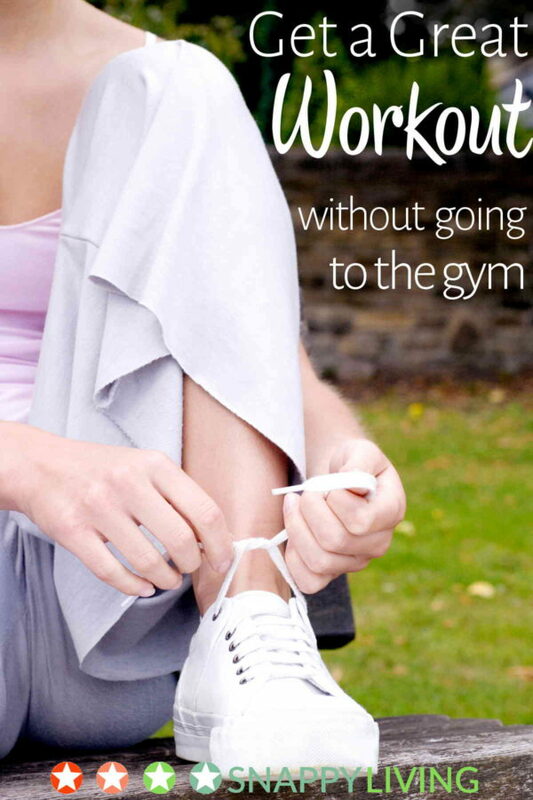 By not having to travel to the gym, you save time. And if you’re at all shy of being watched while you exercise, doing it in the privacy of your own home lets you be uninhibited. You may even get a better workout this way. You don’t need expensive gym machines to get in shape. Plenty of exercises – pushups, jumping jacks, etc. – work as well as anything using equipment. Or, if you prefer walking or jogging, you can do that outside, weather permitting. The rest of the time, malls, parks, school tracks and other public options have your back. If you still want equipment, plenty of very affordable and small substitutes work well. Steppers range from about $20-100, and the $20 one I picked up on Amazon a few years ago has held up wonderfully to near daily use. Steppers are also apartment friendly, because you won’t make any thudding noises that disturb your neighbors. Mine leans against a bookcase when I’m not using it. Some of them are designed to hide away under a bed or couch. Another equipment-free option is to crank up some music and dance your heart out at home. You don’t need to be good at it – just vigorous. It’s also fun, which is great if you find normal exercise boring. And because you’re not in public, you don’t care who sees if you trip over your face. If you miss those gym machine gadgets that tell you how fast you’re going and whether your heart’s in the zone, make a playlist of workout songs. And you can buy a FitBit or a more affordable pulse monitor. Another advantage to home workouts is that you don’t feel the need to cram in everything in every session. Most gym users go to the gym about three times a week, and do all their cardio and strength training at once. If you know you don’t have time for the full workout tonight, you’re likely to skip it. At home, you could spread it out a little: do a half-hour of cardio 5-6 times a week instead of doing forty-five minutes of it three times a week, plus your strength training for one muscle group one day, another muscle group on another day. If you’ve been taking yoga classes, congratulations! You should be ready to create your own program. At home, you can customize your yoga workout to stretch the parts of you that need it more than others, to relax more fully, to do whatever it is you need. DVDs can help, too. Lifting weights is good for everybody. Again, you don’t actually need to buy any equipment. Human beings have been shaping their bodies without it for years. You just need to use exercises that use your own body weight to work out your muscles: push-ups, crunches, leg lifts, etc. But dumbbells are very affordable, and you can even buy them online with free shipping, and at the appropriate weight they will provide enough resistance for anyone who’s just trying to keep in shape. If you’re lifting to gain weight, you may need a set of barbells, but these will also pay for themselves over time compared to maintaining a gym membership and all those other costs. A note on free weights versus machine weights: a ten pound free weight will seem a lot heavier to you than the ten pound setting on a weight machine. Start out with lower weights for your dumbbells than what you were used to with a weight machine. Believe it or not, if you do your lifting slowly, with great attention to feeling the challenge in your muscles, you can get excellent results with 2-10 pound weights. Always err on the side of buying dumbbells that are too light rather than too heavy. You can still get a great workout with the light ones, but you can hurt yourself with ones that are too heavy. Getting a workout at home is actually very easy and inexpensive. If you have the advantage of knowing your body already and having established a routine at a gym, it’s even simpler.